Powdersurfing is a new activity and there are many misconceptions about what is possible. We are happy to help you better understand this activity/lifestyle and get the most out of your powsurfing experience. Grassroots is the product of a deep rooted passion and love for riding powder. We started from absolute zero in a tiny garage in Logan, Utah. No money, no connections, no resources. Just passion and drive to create something new for the mountain riding culture. In the winter of 2007 we arrived at a solution that was original and unique in direction, shape, and vision. We didn’t just hop on the “powsurfing” bandwagon, we created it and we have been driving it since day 1. Our product was the first of it’s kind to hit the market and while other’s may try to imitate, no other product comes close in quality and performance. We’ve blazed our own trail since the beginning and we continue that mission to this day. We proudly make and ride the best powsurfers on the planet. Feel good about supporting a company owned and operated by people who are dedicated to the powsurfing lifestyle and committed to making the best products possible. Where do I stand on my powsurfer? The best stance to take on your powsurfer depends on the depth and density of the snow that you are riding. As a general rule, it is best to ride with your back foot about 8 inches from the tail end of your board. Your feet should be at least shoulder width apart or wider. It is often necessary to adjust your foot positioning as you ride to help you “plane out” in various depths of snow and to accommodate for variations in terrain. A heightened state of awareness and a low center of gravity is crucial. If you are riding the Blunt Twin MPH model, your stance will be different from any other model. You will want to stand at the center of the board, with equal tail and nose lengths. This board performs it’s best with this stance, and that is perfect for being able to ride both ways and push the limits of freestyle powsurfing. Will my powsurfer perform in wet snow and other less than ideal conditions? Our powusrfers can be ridden in most any type of soft snow conditions. A few inches is all it takes to be able to turn and ride in control. We design boards for the Light and dry, warm and wet, slush, sierra cement, …everything in between. If soft snow conditions are less than 3 inches or so, it is best to stick to lower angle terrain or you will not have good control. Snow must be soft enough for the edge to penetrate the surface. For steep slopes a general rule is about 5-6 inches. As snow becomes deeper than that, any of our models will work great and each will have it’s special unique feel. When you reach depths over 24″ you may want to go up a size to the 150cm boards and choose one of our deep powder models for the best performance. Pay close attention when picking a shape for your body size and for the conditions you ride in most often. We design different models specifically to handle certain types of challenging snow conditions. If you are uncertain, feel free to email us and we are happy to help you find the best fit for you. Can I ride my powsurfer at ski resorts? There are a select few ski resorts that currently allow powsurfers on their mountain and lifts. Revelstoke BC, Steven’s Pass WA, and Donner Ski Rance CA are a few examples. However, keep in mind that groomed runs and hardpack snow make for horrendous powsurfing conditions. Kind of like trying to surf waves on a flat lake… it doesn’t really work out. There are often great side-country access from resorts but the best powsurfing conditions are found in the backcountry and even in the backyard or local park/sledding hill. What kind of boots work best for powsurfing? A soft topped boot with a thin, flexible sole will work best for powsurfing. A soft snowboard boot, sorrels, or any other brand of snow boot will work just fine. Hiking boots will work as well but they lack good ankle support and keeping the snow out of your shoes can be a real pain, especially if you are traveling deep into the backcountry. It boils down to personal preference on how soft your boot needs to be. The main things to look for are flexible soles that allow you to feel the board under foot. Rubber soles will always grip better than foam and plastic soles. What do I use for a leash, to keep from losing my board? We highly recommend a proper leash system that is engineered for safety. We offer low profile retractable leashes or coil style leashes in our webstore. The retractable is our favorite as it is barely noticeable when riding, there is no recoil that will send the board flying back at you, it allows maximum freedom to spin and flip the board and it attaches nicely to a belt, allowing it to be quickly released in the event of an emergency. 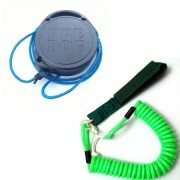 The coil leashes are a great option if you are not intersted in spinning or flipping the board. They are specially designed to minimize recoil kickback and stretch to about 12 ft. Both of these systems keep the leash from dragging on the ground and catching on rocks and trees. While you could use paracord, a dog leash, or surf leashes, they are not engineered for safety. ** Always make sure you have a way to quickly release your leash in the event of an emergency such as an avalanche or a fall resulting in a bad tangle with your leash. Understand that leashes can be very dangerous and could lead to serious injury or death. How do I find good powsurfing terrain? Good powsurfing terrain is all around you. It can be found at your local park or sledding hill, or it can be deep in the backcoutnry. You simply need a slope and some soft snow. The scalability and versatility of a powsurfer enables the rider to have fun on any size terrain, from small hills to the steepest mountains. Creativity is the name of the game and no that your feet are unattached there are all sorts of new ways to challenge yourself. If you are heading into the backcountry be sure to check your local avalanche advisory, carry the necessary safety equipment, and know how to use it. Experience is the best teacher but be wise in gaining that experience. Sheltered North facing slopes will generally hold good quality powder conditions for long periods of time, but be aware that avalanche danger can be higher in these areas so watch your slope angles. Make smart choices, be considerate of those around and below you, and live to surf another day. What is the best way to get to the top? There are many ways to get to great powsurfing terrain. Your own two feet can take you to amazing places. 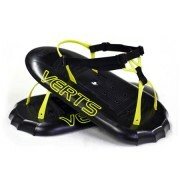 Verts are a great solution for shorter and more direct runs, or hiking up steep slopes. Incredibly light and efficient, these are one of our most used tools to access the goods. 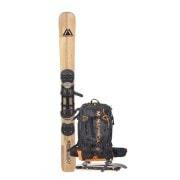 One of the best solutions for longer tours and easy travel in deep conditions is the Mtn. Approach System. We have heavily tested the Mtn Approach kit and back it 100%. We craft custom splitsurfers in a few different styles and sizes. View our selection of splitsurfers. There is more information about splitsurfers here on our blog, or you can watch a short film about the development and benefits of splitsurfing here. Snowmobiles, snow cats, and helicopters work really well too. But there’s nothing like the satisfaction of paddling out under your own power. How does the board stick to your feet? The board doesn’t stick to your feet. Gravity, balance, and skill is what keeps the rider on the board as you ride down the mountain. Just like skateboarding or surfing, if you are riding a properly shaped and designed board, there is no need for bindings, ropes, magnets, skyhooks, or any other gimmick to make the board stick to your feet. The design of our boards allows the rider to “ollie” or pop off the lip of a jump, cliff, or even flat ground. This requires some technique, practice, and muscle memory, just like doing an ollie on a skateboard. This skill allows you to better keep the board with you in the air. It is much more difficult than catching air on a snowboard, and therefore much more rewarding. How deep does the powder have to be? It depends on the density of the snow and the steepness of the slope. If the quality of the snow is very dense and heavy, you can ride your Grassroots Powsurfer in as little as 3-4 inches on most slopes. If only an inch or two, you will want to pick very mellow slopes to ride. Lighter snow densities require a bit more snow depth 4-5 inches or more is ideal, and this varies depending on which model of powsurfer you own. In very deep snow, your powsurfer will float better than most snowboards. Keep in mind all powsurfers are NOT created equally. 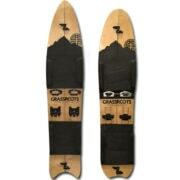 These are specs that work for Grassroots Boards ONLY. For help choosing the best board for you and your riding environment feel free to email us. How long does it take to learn to powsurf? On a Grassroots Powsurfer learning to powsurf is fairly simple. If you have experience snowboarding then you will have no trouble learning. It usually takes a few runs in proper conditions to get the hang of it. Some people pick it up on their first run. Enjoy the learning experience and before you know it you will be slaying the pow. We make a couple of different entry level boards that are simple to learn on. If you need help finding the best board for you don’t hesitate to email us. **This is the case with Grassroots Powsurfers ONLY. We have seen many knock-offs from other companies that do not provide a good learning experience, even for very skilled riders. Beware of companies who tell you that “one board fits all” this is not the case. These companies are just trying to make a buck off of powsurfing without investing proper R&D and effort into meeting the needs of individual riders. If a board has a rope/bungie or skyhooks attached to it, this is a huge red flag, telling you that this board will not ride well without these gimmicks/training wheels. A properly designed powsurfer does not need bungies, ropes, hooks, or anything else to be able to ride with great control. Do I need to wax my powsurfer? Yes you need to wax your powsurfer just as you would any snowboard. Hot wax can be used on the P-tex based boards and rub-on wax is recommended for the wood bases. The ptex bases are far superior in durability, wax absorption, and speed. More speed means more float and proper float leads to the best performance and control. So keep em waxed up! We recommend using Bluebird Wax, because it’s the best wax and it is made by a company owned and operated by riders. For our 3-Dimensional Base powsurfers use a small iron or use the tip of the iron to get wax into the concave of the base. You may need to scrape horizontally instead of vertically in these areas. Then use a cork or scotch pad to buff the thin layer smooth. What do I do if I damage my powsurfer? If you damage the sidewalls or base of the board you should fix it as soon as possible to prevent further damage. Dry the board out and fix using epoxy to prevent water from entering the wood. Which is better, P-tex base or wood base? P-tex bases are much faster, much more durable, and they hold wax longer than a wood base. Having a faster board will translate into better floatation on top of the snow and in-turn, much better performance. From that perspective, the P-tex base is highly recommended. Wood based boards are about a half pound lighter and they hold the natural beauty and aesthetic of wood grain. You may need steeper slopes to get the wood boards up to speed for proper float. Durability is a major factor with the wood bases. They will not handle rock damage well at all. They tend to explode and splinter, and they can be very difficult to repair properly. The ptex base is much easier to repair and it will hold up 5x better than the wood base should you hit rocks or other debris. What type of terrain is the best for powsurfing? This is dependent upon the snow quality and depth. Generally speaking, the more shallow the soft snow is, the more mellow your run choice should be to get proper edge hold for turning. When conditions get above 6 inches or so, the medium and steep terrain is the way to go. The deeper it is, the faster you need to go to get he board to properly plane out and float atop the snow. When your board is planing properly this is when riding is the most natural and fluid. Basically the faster you ride, the more control you gain. When the snow is 6″ or deeper, the best terrain for powsurfing are slopes with medium to steep pitches and a continuous fall line. Long areas of flat or long traverses can be a pain in deep and slow snow conditions. Long runs are great, but realize that snow conditions can change with elevation drop, so know your line. Hiking up your line is a good way to tell. Of course only hike up your line if avalanche hazard is not a factor. Short runs are great for multiple laps. There is no time wasted unstrapping so it is easy to make multiple laps on medium and short runs. Good snow coverage is important so that you don’t snag any rocks. There are so many ways to have fun on a powsurfer, small terrain can be made challenging by getting freestyle (spinning and flipping) on your board. Medium sized terrain feels bigger when you ride a board free of bindings, small drops feel big, big drops feel huge. Steep and deep terrain is epic, but realize the risks of falling can be much greater because it can be difficult to stop tumbling or sliding down steep slopes. There is also a heightened risk of avalanche. How is powsurfing different from noboarding? Powsurfing is different in both the equipment used, technique of riding, and in what is possible on the boards. A powsurfer is a board that is shaped specifically for the purpose of riding without and bindings or ropes, therefore it is a true binding-free experience. Powsurfers are shorter, wider and shaped differently than traditional snowboards. The ride and feel of the boards is much different than that of a snowboard, as is the technique and foot position for turning and riding. Powsurfers are much more agile and “surfy” feeling. Because of the shape and design of the powsurfer, the rider is able to turn and control the board in as little as a few inches of soft snow as well as in the deepest powder conditions. The rider has unlimited stance options and is free to move to any position on the board- allowing the rider to ride backwards or forwards. There are no ropes to get in the way of the boards ability to spin and flip on command of the rider. You can ollie! -At least on our powsurfers you can. This opens up the potential of freestyle riding and enables the rider to truly take advantage of being on a binding-free board. Powdersurfing is 100% binding-free at all times. No ropes, no straps, no skyhooks or any other gimmicks. This is the real thing. “Noboard” is a trade name (Noboard Sports Inc). Noboarding refers to riding a regular snowboard with the assistance of the “Noboard pad”. The Noboard kit consists of a 26″ pad with a rope (nylon bungee) attached at either end of the pad that is used to hold the snowboard to the riders feet to enable the rider to turn, stop, or jump with the board. The Noboard pad is made to attach to any snowboard. Because snowboards are designed to be ridden WITH bindings, they are shaped and engineered accordingly. Because of this, when you take the bindings off, the boards are difficult to control when the snow is less than knee deep and the rope becomes necessary for control. So most “noboarding” is done with the rope in hand, holding the board to the riders feet to get it to turn properly and to catch air. If the terrain becomes mellow enough and the snow is deep enough the rope can be dropped and the rider gets a chance to ride “binding-free”. Noboarders refer to this as “no-ropping”. This is obviously much different than powsurfing in terms of difficulty, style, and in what is possible on the boards. While powsurfing, the rider is truly binding-free at all times just as a skateboarder or snowboarder would be. Whereas holding onto a rope to control the board (noboarding) would be more comparable to riding a scooter, instead of a skateboard. Powsurfers perform in any steepness of terrain and in much shallower powder conditions than a bindingless snowboard could. Powsurfers can be ollied to catch air, and there is always the option to spin and flip the board underfoot. Noboarding and Powsurfing are both incredibly fun, and it is up to the rider to decide what is best for them. Other Questions? Feel free to drop us a line.